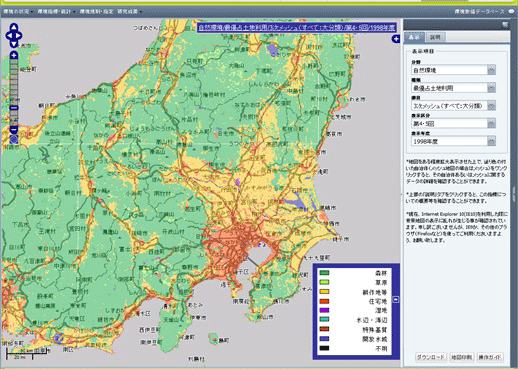 Ogawa, M., Takenaka, A., Kadoya, T., Ishihama, F., Yamano, H., and Akasaka, M. (2013) Land-use classification and mapping at a whole scale of Japan based on a national vegetation map. Japanese Journal of Conservation Ecology 18:69-76. Akasaka, M., Takenaka, A., Ishihama, F., Kadoya, T., Ogawa, M., Osawa, T., Yamakita, T., Tagane, S., Ishii, R., Nagai, S., Taki, H., Akasaka, T., Oguma, H., Suzuki, T., and Yamano, H. (2014) Development of a national land-use/cover dataset to estimate biodiversity and ecosystem services. In: Nakano, S., Yahara, T., and Nakashizuka, T. (eds.) The biodiversity observation network in the Asia-Pacific region: Integrative observations and assessments of Asian biodiversity. Springer. 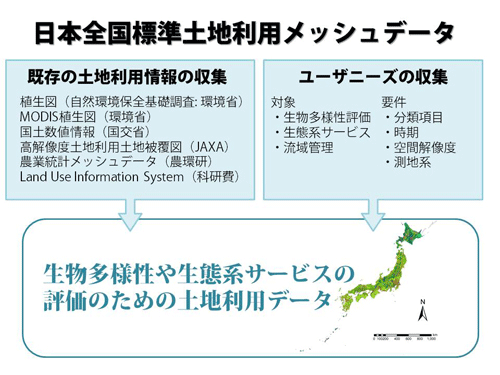 Copyright Center for Environmental Biology and Ecosystem Studies, NIES, Japan, All Rights Reserved.